Program commands. Sold as a Kit or Custom Switcher. 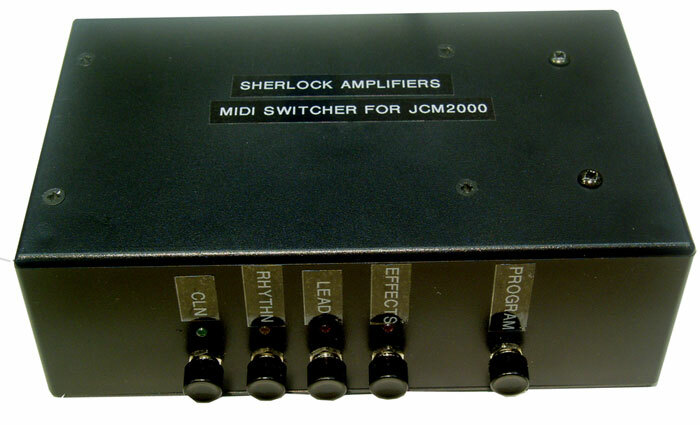 As your set up grows, increasing your sonic possibilities, the addition of Sherlock Amplifiers innovative Midi Mod, either installed in your amplifier or as a stand alone Switcher box, can help you stay in control. We have built Switching boxes for many popular amp models from a range of manufacturers. In most rigs, one footswitch controls only one feature. Changing from a clean sound with reverb to a boosted dirty sound with no reverb requires one stomp to switch channels, one to turn off the reverb, and another to engage the solo boost; three different switches in all! The Midi Mod dedicates and entire sound to each footswitch, not just a single feature, allowing you make the same sound change instantly with the stomp of just one switch. That same sound can then be accessed at any time! The Midi Mod is capable of storing up to 100 combinations of the different foot switchable features of your rig, more than most guitarists are ever likely to need. 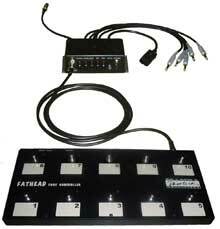 A highly recommended optional extra is the FAT HEAD Foot Controller, a heavy duty, no nonsense MIDI pedal board that gives you instant access to your 10 favourite sounds. The Midi Mod can be controlled by any standard MIDI foot controller and will work seamlessly with all MIDI equipment. Simple yet powerful control of your sound sets you free to focus on much more important things like playing and performing! A tipical MIDI Switching system showing the Midi Mod switcher with 1/4" jacks for controlling the amps channels etc, midi thru and power cable. The controller is phantom powered by the switcher. This switcher is mounted in the back of a Mrk 4 Boogie. So just how hard is it? Although some guitarists feel that anything involving the “M” word is all too difficult and that you need to be a rocket scientist to deal with it, this is certainly not the case with the Midi Mod. Sherlock Amplifiers have done all the hard work to make the power of MIDI work for you in a form that is very user friendly. Storing a sound for instant recall requires only three simple steps. Select the amps channel or functions using the corresponding buttons on the Midi Mod. The led or leds on the Midi Mod will light up to indicate which channels or functions have been selected. Press and hold the “Prog” button for 2 seconds. The Midi Mod will now save this combination and assigned it to the patch number selected on the foot controller (in step 1), and your done. To check your programming has been successful, select another patch number on your MIDI controller and then select the one you selected in step 1, and the Midi Mod switcher will recall your programmed combination. 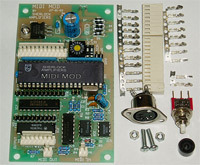 The Midi Mod can be purchased as a kit requiring installation (see below), or as a stand alone Switcher made for you amp. Below are just some of the switchers we have made over the years. They come in various configurations and with features depending upon the customers requirements. Midi switcher for Peavey 5150 Mrk 1 & 2 amps. Controls all 3 channels and Effects loop. Custom cable made for the amp, plugs into footswitch socket. Requires 9vdc power. 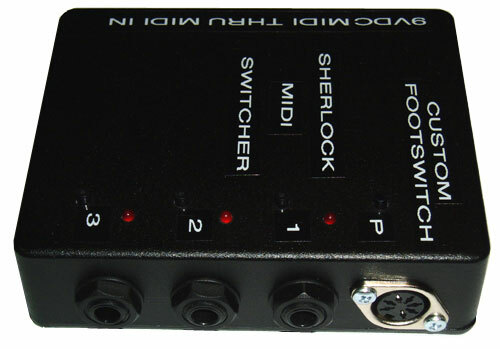 Midi switcher for Peavey JSX amp. Controls all 3 channels and Effects loop. Custom cable made for the amp, plugs into footswitch socket. Requires 9vdc power. 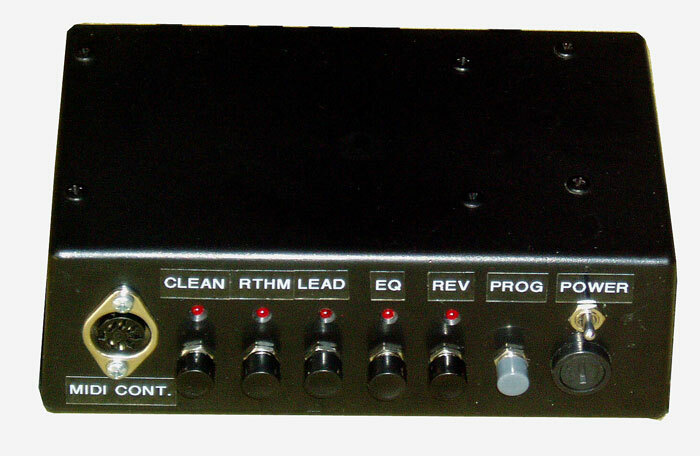 Midi switcher for Mesa Boogie RoadKing amp. Midi switcher for Mesa Boogie Dual Rectifier amp. Controls the channels, Effects loop and Solo Boost. Midi switcher for Mesa Boogie Triple Rectifier amp. Controls all 3 channels, Effects loop and Solo Boost. Midi switcher for Marshall JCM200. Controls all 3 channels and Effects loop. Also fitted with Phantom power for the controller. Custom cable made for the amp, plugs into footswitch socket. Mains powered. 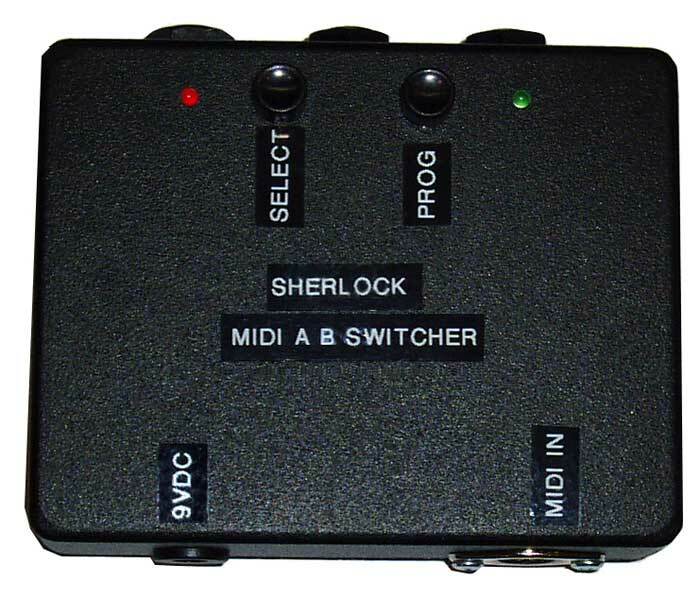 AB box Midi switcher for Midi Controlled switching. Requires 9vdc power. We also make custom switching cables that will connect the Midi Mod switcher to most amps either by plugging into the amps switching sockets or footswitch socket. We also make a 5pin or 7 pin MIDI cable. And of course if you are stuck for a Mid controller we make a simple yet rugged 10 button foot controller. The Midi Mod is also sold in kit form for the DIY types and consists of all the parts for a basic installation into an amp or a stand alone switcher as shown above. If you wish to purchase the Midi Mod kit please read the installation options. You or a Technician install the Midi Mod PCB kit into your Amp. 3. 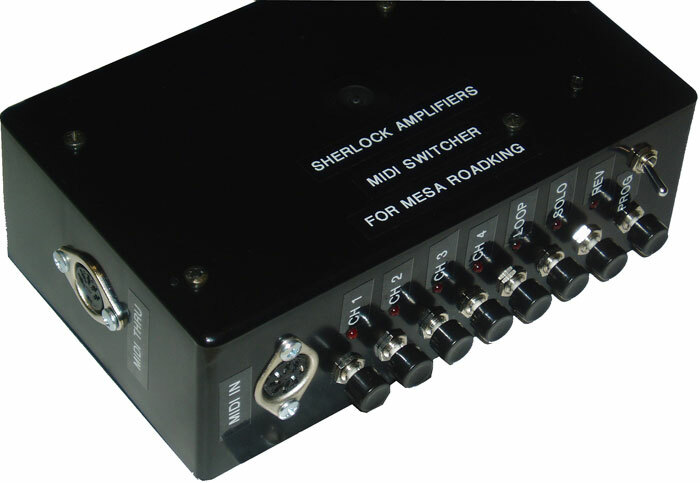 We (Sherlock Amplifiers) could do the installation for you as we are the designers of the Midi Mod and have performed this operation countless times before. 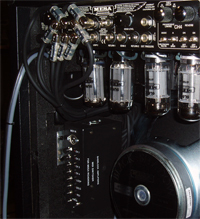 The pic shows the Midi Mod kit installed into a Peavey 5150 head . 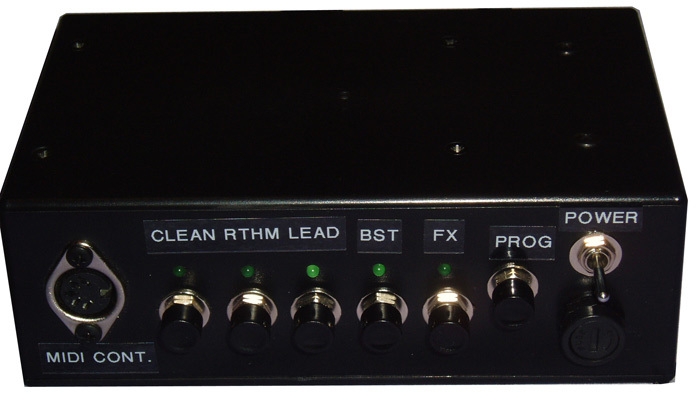 This Installation controls the channels, effects loop and an added boost volume for the lead channel. 1. Supply us with you Amp including your footswitch, Midi Controller, midi cable and anything else that you have that you want to be part of your new midi system. If you are not local you will have to freight the amp or just the amps chassis. 2. 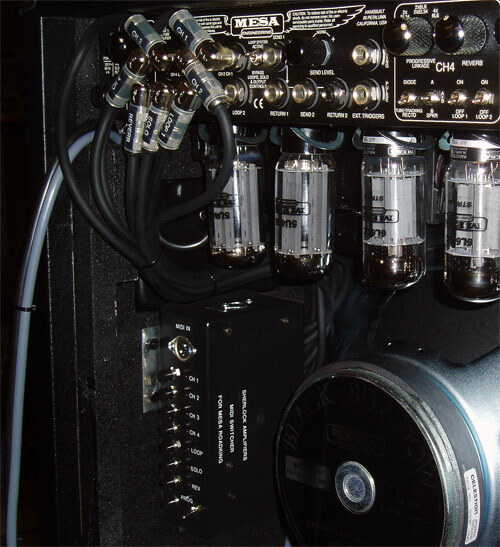 If we don't already have it, you will need to supply your amps schematics or relevant info for us to derive circuitry to interface the Midi Mod to your amps channel switching circuitry. If you cannot supply schematics, and we don't already have them, we will have to source them ourselves or try and do the installation without schematics which can also be done. The cheapest option is for you to do the leg work and supply all relevant info. Build the Midi Mod Kit into a custom stand alone Midi switching unit as shown above. The cost for this option will depend on how many Amp functions you want controlled by the Midi Mod. Again you can either do this yourself or employ the services of a competent Technician of you’re choosing or you can have it made up by us. If we were to build your Midi Switcher you would have to supply us details of you amps switching jacks and existing foot switching arrangements and we would make leads etc to adapt the midi switcher to you amp. Also, your amps manual and or schematics would be very handy but not essential. If we were to make a midi switching unit up for your Amp without having your amp with us to test it we would require as much info as possible (i.e. info as described above) to ensure that the midi switcher worked correctly when returned to you. Midi Mod Kit RRP AU$160 Freight approx $10 anywhere in Australia. 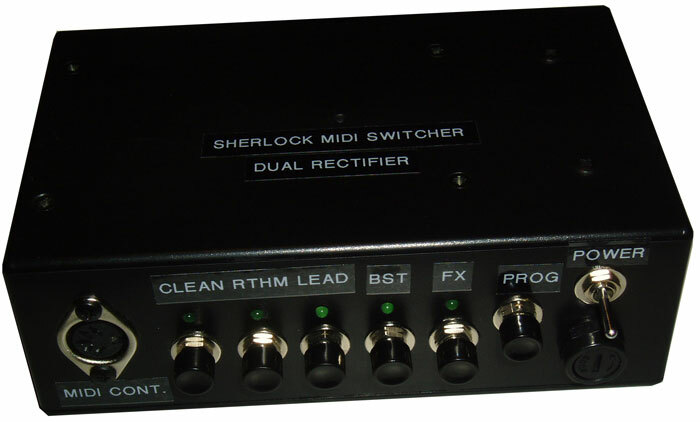 Custom built Midi Switcher from RRR AU$300 Freight up to $20 anywhere in Australia. 4 OPERATING MODES for control. 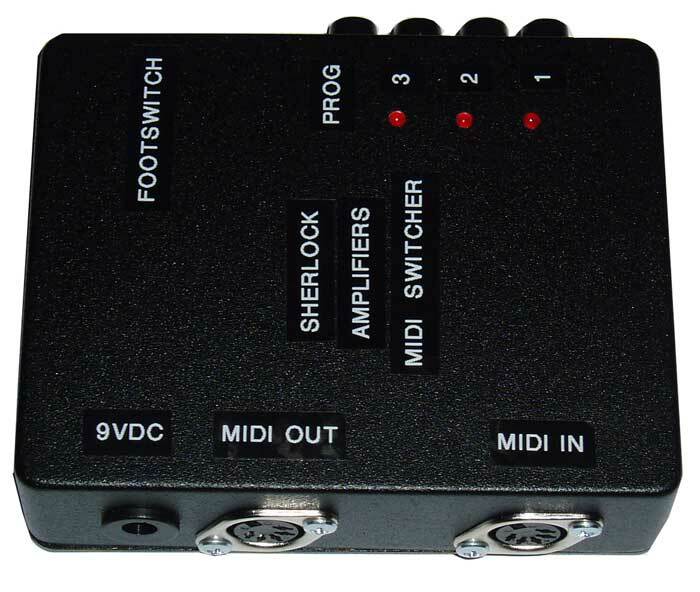 Buy as a Kit or Stand Alone MIDI Amp switcher. Can Interface with any Amp.